The A.B. Graham Ohio Hi-Point Grain Merchandising team finished fifth in the state of Ohio during April’s state competition on Tuesday. ST. PARIS – The A.B. Graham Ohio Hi-Point FFA chapter members recently competed in the Ohio FFA Grain Merchandising contest. The purpose of this contest is to make students aware of the decision-making process associated with merchandising agricultural products. Chapter members Chasen Poole, Emmalee Cecil, Sam Stickley, Matt Case, Lindon Hoblit, Todd Crawford, Cooper Strader, Hunter Mays, Cierra Furrow, Katelynn Wallace, Tyler Purk, Zack Bumgardner, Tylar Bailey, Blake Hoffer, Dawson Rowe, Marleigh Brown, and Bryant Crisler completed the online test portion on February 26. During the online test, members were given 50 general knowledge questions and 5 problem-solving questions about grain merchandising covering hedging, basis, puts, and calls. The team finished in the top 10 in the state and qualified for state finals on April 2. 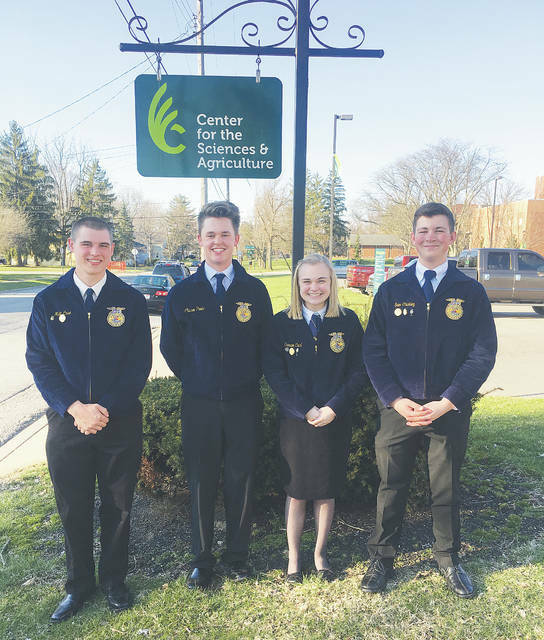 Poole, Cecil, Stickley, and Case traveled to Wilmington College where they completed a scenario that consisted of the students being the grain producer where they had to develop a marketing plan to market their crops. They were given 30 minutes to prepare, 10 minutes for their presentation, and 5 minutes for questions from the judges. At the end of the contest, the team finished 5th in the state. https://www.urbanacitizen.com/wp-content/uploads/sites/36/2019/04/web1_Grain-Merchandising-Team-Photo.jpgThe A.B. Graham Ohio Hi-Point Grain Merchandising team finished fifth in the state of Ohio during April’s state competition on Tuesday.